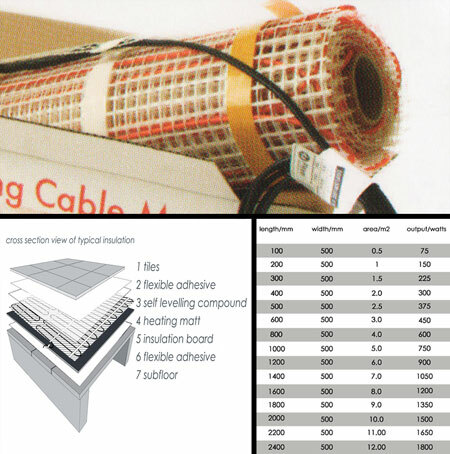 Our electrical underfloor heating mats have the heating elements woven into the mat allowing. This allows for easy and quick installation by simply rolling out on to the floor, covering with latex self levelling compound and then tiling. Our electric flooring mats are supplier in 150 watts per m2. We also offer flooring insulation and digital thermostat / timer controls for efficientcy and energy management. * Complies to British standards. * Can be primary heating source. * Economical to install and run. * Heating mats 150watts per m2.